Even when it’s cold outside, there is still heat energy present. A heat pump pulls this energy into your home and releases it where desired. Some mini-splits can still extract heat energy from temperatures as low as -30 degrees C, making them ideal heating solution for even the harshest Atlantic Canadian winters. With a push of the button on your indoor unit, A heat pump can start extracting the heat from inside your home and pumping cool air indoors. While moving cool air inside your home, mini splits also helps dehumidify the indoor air. 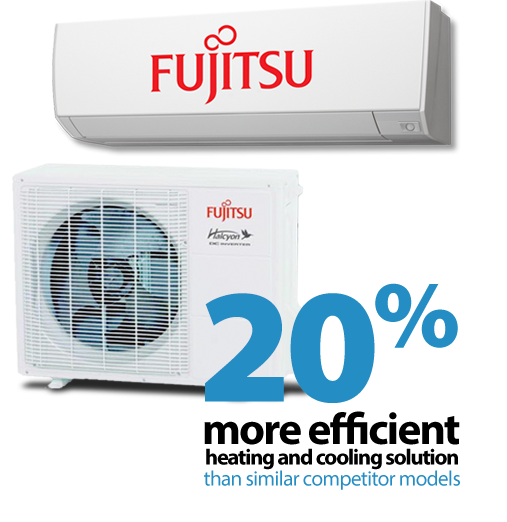 Fujitsu has been the best brand in heat pumps for over 20 years. Fujitsu heat pumps exceed the highest efficiency standards in the country and as Canada’s largest Fujitsu dealer, we bring unmatched expertise and maintenance to your home. Backed by a full 10 year parts & labour warranty you can rest easy knowing you have an ultra quiet, energy-efficient solution in your home. Don’t sweat it. You can rent it! Your free assessment includes a review of your electrical panel and service, a home layout and square footage review, discussion on which areas of your home are most frequented and some basic education on how Mini Split Ductless Heat Pumps can reduce your home heating costs.